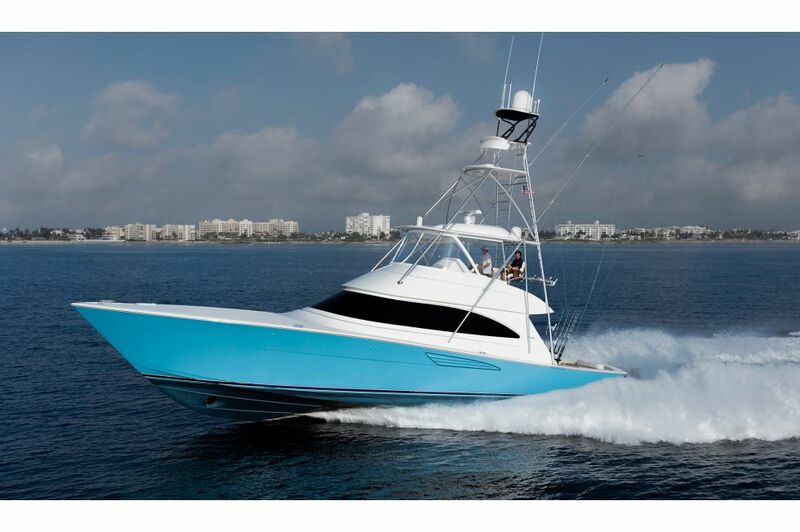 The Viking Yacht Company is proud to announce the second generation of our 58 Convertible, the successor to the legendary 1990s model that helped build the company into a sportfishing powerhouse. Eighteen years later, Viking’s “Gen II” 58 C promises to once again leave the competition in its wake and stake its claim as not only a tournament champion but as the best high-performing family cruising yacht in its class. The 58 C comes on strong with our signature walk-around center console flybridge helm and spacious cockpit and observation mezzanine. 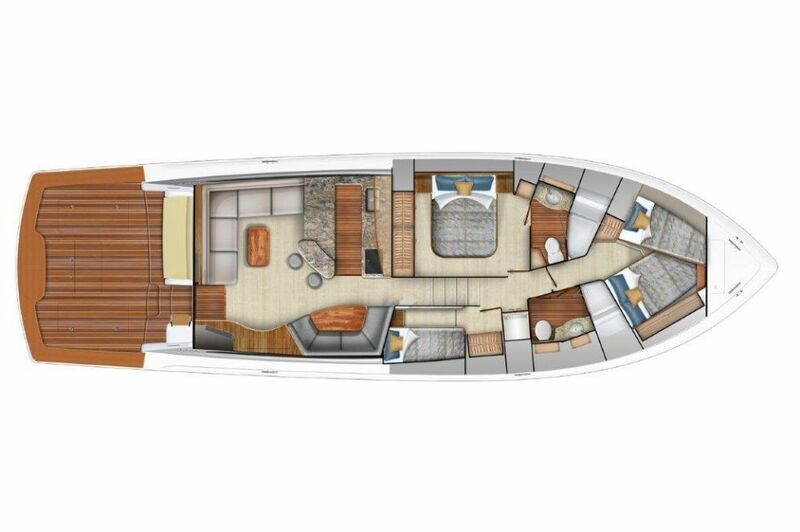 The private and comfortable three-stateroom, two-head layout maximizes the vessel’s 17 ft. 9 in. beam, while the salon and galley arrangement provide the perfect mix of amenities for entertaining, relaxing or dining. 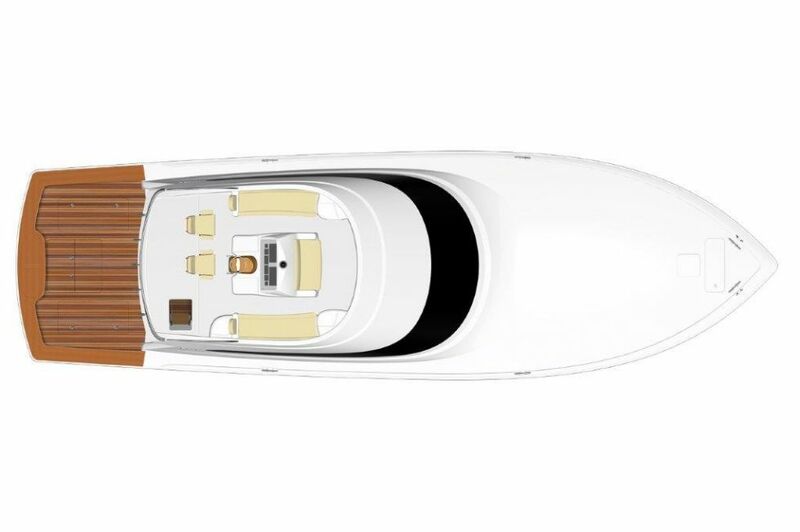 You’ll be hard pressed to find a boat in its class with a cockpit larger than the 58 C’s, which measures 165 square feet. Every Viking takes advantage of the company’s tournament-proven experience. We’ve armed the new Viking 58 C with an arsenal of fishing equipment and an abundance of storage to put you in the winner’s circle. A sampling: a laminated in-deck backing plate for future fighting chair, rocket launcher, or table installation; a raised transom box for a live well or storage; an in-deck starboard fishbox and an optional in-deck port live well; flush-mounted rod holders; a side locker for gaffs; a walk-through transom door with lift gate; rounded coamings and toekick space for comfort and balance; and fresh and seawater wash downs. The boat is specifically designed and engineered for the installation of a Seakeeper gyro stabilizer, which is easily accessible through the lazarette hatch on centerline. Besides providing access to the engineroom, the observation mezzanine is filled with comfortable padded seating, a tackle cabinet with drawers and freezer and cooler space. There’s also an option for mezzanine air conditioning. The center console walk-around command station on the flybridge is equipped with power-assisted hydraulic steering, single-lever electronic controls with station select and keypad, and electronic trolling valves. Visibility is excellent in all directions. The captain and companion sit in two pedestal seats. Guests have their choice of lounges that flank the console and an aft-facing jump seat on the starboard side. One of the most attractive attributes of the interior’s spacious layout is the convenient walkway that extends in a straight line from the deckhouse’s aft door all the way to the forepeak. Offset slightly to starboard, this wide passageway opens up the salon, galley and dining areas and exemplifies how Viking maximizes interior volume with comfortable, intelligently placed accommodations and conveniences. The salon is the perfect gathering area for relaxing and entertaining in air-conditioned comfort. It has an L-shaped lounge (with stowage beneath) with a complementing cocktail table and a home theater with flat-screen HD TV and a premium stereo system. The galley, which is across from the starboard-side dinette that comfortably seats four adults, features engineered stone counters, Amtico flooring and a two-stool bar area. Under-counter Sub-Zero refrigerator and freezer units with deep pull-out drawers, high-gloss teak-faced cabinetry, a four-burner cooktop and a microwave/convection oven are just a few of the galley’s standard amenities. The master and forward staterooms each have queen-size berths with custom inner-spring mattresses and private access to the heads with spacious fiberglass shower stalls and built-in molded seats. Crossover berths also are available in the forward cabin. The port stateroom features side-by-side berths with a large hanging locker. The washer and dryer in the companionway are conveniently complemented with a nearby linen locker. Viking’s construction, engineering and mechanical systems lead the industry. We build the hull with resin-infused end-grain balsa core sandwiched with fiberglass and hybrid carbon-fiberglass fabrics. The integral fiberglass fuel and holding tanks are also resin infused with balsa coring on all sides for stiffness, and the main structural bulkheads are built in the same resin-infused process but with composite coring material. Several engine packages from MAN and MTU are offered with the new Viking 58 Convertible. Hull number one is powered with a pair of the new MTU V10 2000 M96L engines rated at 1,600 HP each. With standard fuel (1,551 gallons), anticipated top speed is in excess of 40 knots with a cruise of 35 knots with this power package. The engineroom, lazarette, forward bilge and anchor locker are coated with Snow White Awlgrip, a highly durable urethane, for visibility and easier maintenance. The engineroom houses numerous mechanical systems with superior performance and durability, including engineroom ventilation, fire suppression, and oil changing systems. Batteries are expertly mounted in custom fiberglass storage boxes, and the engineroom is also home to a pair of battery chargers and an Onan 21.5 kW E-QD (electronic quiet diesel) Series genset. The 58 Convertible will make her debut at the annual Viking Dealer Meeting and Sea Trial Event September 10 through 12, followed by her world premiere at the 2018 Fort Lauderdale International Boat Show October 31 through November 4. Come see the next generation of Viking excellence.